On screen you might recognize her as Imogen Moreno, the girl with a spunky sense of style. But off-screen, Cristine Prosperi’s style could not be any more different. She has mastered the perfect combination between being effortless andput together. While usually sharing her outfit choices with her Instagram followers, Cristine is taking her love for fashion one-step further. She recently started a fashion blog called StyleProsperity to share some of her style secrets with her fans. And if you need her help with your Prom style, look no further. 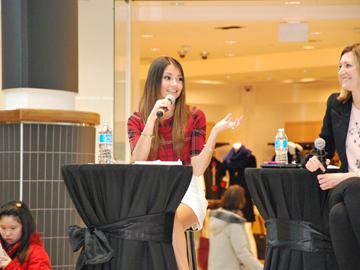 Cristine recently spoke as a style ambassador during a Promdale fashion show (Yorkdale’s newest prom destination–check them out for great tips, events, contests and more). Cristine shared her style tips with audiences, but in case you weren’t able to make it in person, Faze caught up with Cristine after the show to talk prom advice and her personal style. Has fashion and style always been something you’ve been passionate about? I love fashion and family and friends recently started encouraging me to start a style blog. It’s really fun to connect pictures and writing. On Degrassi, you went to the prom with Fiona and with matching pink dresses with sequined detailing. What tips do you have for couples that would want to co-ordinate their outfits without overdoing it? I think when couples match slightly it’s better than completely being twins. Tell your guy to wear a similar colour tie or pocket square. What tips would you have for anyone looking to avoid a prom disaster? Any must-haves to keep in your purse? Be prepared with things like safety pins or bobby pins. Also don’t forget some makeup, just in case you wanna touch up mid-night. Now, shopping for prom can be expensive. While it’s great to try to save money, what items do you think are worth spending that little bit extra on? I would splurge on the shoes. You want a comfortable yet stylish shoe and you’re gonna wear them again another time, no doubt! So I heard you went to three proms and wore three different styles of dresses! Did you prefer one dress more over another? Or wish you would have worn something completely different? I really do still love all my dresses. For two out of three proms, I didn’t go overboard cause they weren’t MY proms. So I kept it simple with a short dress for one, and a summery, long dress for the other. For my own prom, I wore a white dress with some beading. Looking back I don’t know if white was the BEST choice. I wish I had gone with some colour. 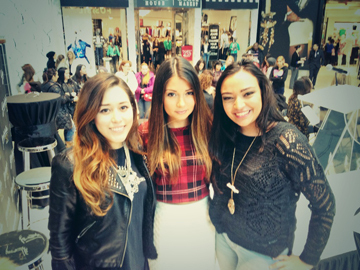 Three beauties: Faze writer Michelle Serdan, Cristine Prosperi and Faze manager Jessica Harwood.